How would the values of msExchRoutingAcceptMessageType attribute change selection? I was helping someone a couple of days back on his problem with his Exchange Server 2003. This guy was running into a problem where users in his organization were able to send their emails to their personal email addresses using an automatic forwarding rule in outlook though the “Allow automatic forward” option was deselected at his Exchange Server 2003 Organization level. It was certainly not really very hard to suggest him to change the value of attribute msExchRoutingAcceptMessageType to 25 which fixed his problem. Yet, it would be really a fun to know how does Active Directory determine what to be allowed and what not to be when it is based on a numeric value? This is a small try to share my findings about it. So, when you look at the following picture you will notice there are some checkboxes selected and some are not. 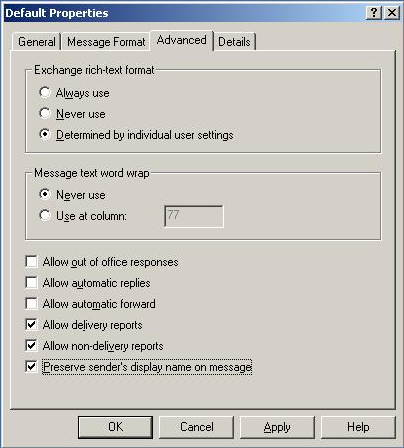 Based on these selected check boxes the value of the attribute msExchRoutingAcceptMessageType. So, when 1st and 2nd check boxes are selected the value of attribute msExchRoutingAcceptMessageType becomes 3. In simpler terms it would be simple addition of numbers based on the above table. The last option is “Preserve sender’s display name on messages” is not relate to these values. Attribute msExchRoutingDisplaySenderEnabled stores the value of it and works on a Boolean values of “TRUE” or “FALSE”. Note: above location may change according to your customized settings. Even before you go ahead follow this blindly and change the settings per your requirement, do take a look at your Active Directory health and replication as well. Exchange may not be able to contact AD for the correct information to read and hence allows the automatic forwarding to internet or does not apply the restrictions mentioned above. This entry was posted on 09/02/2009 at 9:14 PM	and is filed under Exchange Server 2003, General. You can follow any responses to this entry through the RSS 2.0 feed. Both comments and pings are currently closed. Milind one more good post from you buddy ! but I am bit confused about the auto forwarding.. are you talking about the Outlook rules and it can be prevented from been created from the server? I guess you are in ADSIEDIT.. configuration partition..
good info.. but is there any GUI interface to control it? The post is not related to prevent users from creating an autoforward rule in their mailboxes. This is all about fixing a broken Orgnization wide setting in Exchange server 2003. Many times you may encounter a problem of automatically forwarded messages by an outlook rule being sent over the internet though you have already restricted the automatic forwarding of messages from within your organization to internet. I hope that answers your query. "Many times you may encounter a problem of automatically forwarded messages by an outlook rule being sent over the internet though you have already restricted the automatic forwarding of messages from within your organization to internet"
You mean a virus activity ? what does the automatic word mean here .. I am a user I create a rule to fwd my emailt o yahoo.com address. are you talking about this ? Auto forward rule to a external domain ? are you talking about this ?. Dsavi, that is correct it refers to forwarding to external domains. Not because of any virus activity. Thanks for the comment. I will update the article accordingly.